Welcome to day 19! Today’s project isn’t a card but a treat box. I wanted to create a quick gifting idea for anyone who needs a small coworker or student gift. I for one have several individuals that give small gifts of candy/cookies and I thought I’d up my game and add in a little handmade treatbox to the mix. This box was created using my silhouette cutting machine. 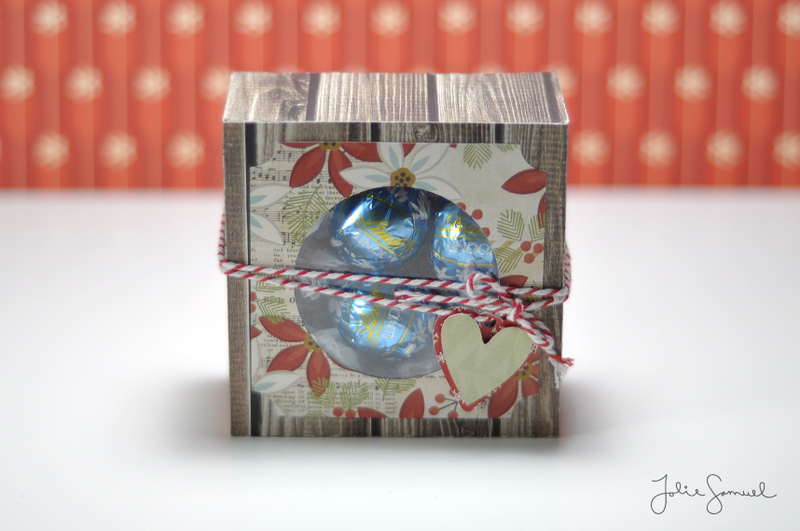 I used a small piece of craft plastic (a bit slimmer than a transparency) to show-off the contents of the box. It’s great for chocolates, popcorn, mini ornaments or even a small pair of mittens. Tomorrow marks the very end of this year’s holiday card series. I’m so excited to share the amazing project! You’re gonna love it! Happy Monday! I’m back with Day 5 of Holiday Cards! Today’s card was created using some wood veneer snowflakes, wood grain dry embossed papers & a magical snowman. I used the 2 tones of woodgrain to create a simple snowbank for the snowman to sit on. To give the snow a bit more dimension it was watercolored with a very light shade of blue. How decked out is this snowman!? I think he’s pretty spectacular! Honestly, this just might be my favorite card yet! More fun and crafts coming for you tomorrow. See you then!